FleetWorks is our website portal that provides quick and easy fleet management at your fingertips. Your access includes information for client, driver and vehicle data. All of your standard monthly reporting and customized reports are easily accessed here. In addition, our Dashboard provides a quick high level summary of your current fleet cost, historical cost and benchmarking your metrics against Velcor® clients or the fleet industry. Velcor Fleetworks® provides easy access to our Dashboard of high level management reports, charts and graphs. Our Dashboard summarizes current and historical costs allowing Fleet Managers and Executives with limited time to focus on fleet matters to make key decisions with complete confidence. The Dashboard provides information on life cycle cost, total maintenance and fuel cost, total miles for your fleet, fleet make-up by make and model. As you implement changes to your fleet program, your cost savings are quickly summarized in the Dashboard. This is a great tool to show senior management the savings generated by your/their decisions. The customer information tab includes the client name, address details and the individual contacts that manage the account. Fleet size, insurance information, manufacturer fleet identification numbers and the fleet management programs the client uses are identified here. A PDF copy of the Master Leasing Agreement and Certificate of Insurance are available here too. Clients have up to 10 user defined fields for each driver and vehicle. These fields are defined in the Customer Information area. The driver tab includes complete driver name, address and contact information, website authorization access and details from the 10 custom driver fields. A complete history of previous vehicles assigned to the driver is available too. Fleet Managers are able to edit the changes to driver information in real-time. With real-time access to driver changes, FleetWorks provides precise reporting for our clients. The vehicle tab provide full details on the vehicle information, vehicle status and current mileage, license plate information, lease terms, monthly payments, the 10 custom vehicle fields, fuel card number. A PDF copy of the factory invoice, Schedule A, title and registration and other vehicle paperwork are all available here. Look here if you need detailed information regarding each fuel transaction or any maintenance service performed on the vehicle. The driver's personal use reporting is available to view here. It's easy to assign the vehicle to another driver in real-time from this page. This tab also includes the ability to order new vehicles for your drivers. The Fleet Manager pre-authorizes the which drivers are eligible for new vehicles and the system automatically handles the rest of the process, which includes notifying the driver they are eligible for a new vehicle and from which vehicles they can choose. Velcor® understands that each company has its own need when it comes to reporting of the monthly rents, fuel and maintenance of your fleet. Our ability to create and provide customized invoice and or management reports exceeds that of any of our fleet management competitors. Most customized reports are created the same day or within days of the originals request. This could include custom modifications to the monthly invoice reports, or any on-demand one time or monthly reports needed. Unlike most fleet management companies that provide a separate invoice for rent and a separate invoice maintenance and fuel, Velcor® provides one invoice that includes all rent, maintenance, fuel and other charges. Our clients process just one invoice each month as opposed to two separate invoices from other lessors. When processing multiple invoices each month, its equivalent to managing a fleet twice the size the client manages. Your invoice can be emailed directly to you in either PDF or Excel format. The Excel format allows you to import the information directly into your own systems, for more efficient and accurate processing. If you prefer, the hard copy invoice can also be mailed. Velcor® offers you the option to automatically pay your monthly rental invoice through an ACH bank transfer. This eliminates the need to print and mail a check each month. Velcor® maintains detailed maintenance history on each vehicle, in order to provide valuable information to you. Velcor® provides many monthly reports on our web site portal Fleetworks, such as weekly vehicle status reports, monthly invoicing, invoice summaries, exception reporting, vehicle inventory & replacement reports, detailed maintenance, maintenance history, used vehicle sale reports, fuel card transactions, fuel card usage reporting and business versus personal use reporting. In addition, our web site portal provides the ability to our clients to create many customized reports. For each fuel transaction you can see the name and address of the filling station, date and time of the transaction, vehicle odometer, number of gallons purchased, cost per gallon of fuel, fuel type, service type (self or full), and miles per gallon between fill-ups are tracked. Our website portal gives you complete access to critical fuel data, which allows you to monitor your fuel costs and create cost savings reporting. Each year the IRS requires a company to report the personal use of a company vehicle on the driver's W-2. Through Velcor Fleetworks® drivers can easily track their personal use each month. If you require your drivers to pay a monthly personal use charge, Velcor® can track this too. With the personal use data stored in each vehicle's history file, Velcor® creates detailed personal use reports that tell your payroll department exactly what to add to each driver's W-2 at year end. This tool allows Fleet Managers or Executives, at their leisure, to explore all domestic and foreign vehicles pricing, standard and optional equipment. Both the factory invoice and MSRP pricing is provided. Velcor Leasing provides excellent customer service, anytime I call I have received direct and complete answers to any of my questions. On more complex questions, responses are received timely and accurately. They have placed the bar very high for other fleet management companies to try and measure up to. Through Fleetworks, your driver has access to our website portal to report their monthly personal mileage on their vehicle. With a couple of fast clicks of their mouse, the driver is able to easily and quickly report personal mileage each month. 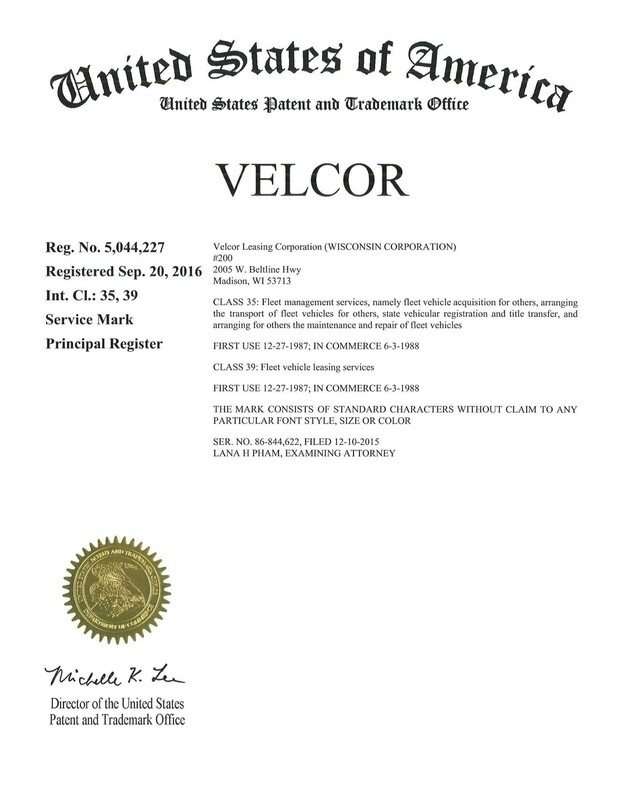 When our clients utilize Velcor®'s New Vehicle Order Authorization program, drivers are notified by e-mail to that it's time to replace their company vehicle. Drivers log in to Fleetworks to review their new vehicle choices, vehicle equipment and colors. After deciding which new vehicle to order, the driver selects the vehicle and both the Fleet Manager and Velcor® are immediately electronically notified. This entire process is performed by point and click and it's completed at the driver's leisure. Once the new vehicle is on order, the drivers are able to check the status report of their vehicle while it's on order with the manufacturer. The status report informs them when the vehicle will be built and shipped. The delivering dealer contact details are provided to make the new vehicle pick-up a smooth seamless transition.